Scrapping Mommy: Brrrr....It's Cold Out There!! I cut the house with my Cricut and the Winter Woodland cartridge for the house and the Fancy Frames cartridge for the fancy background layer. The background is embossed with the Cuttlebug and the Snowflakes die. I added some white paint to the raised surface on the blue background to make it stand out a little bit more. The snow on the house has some stickles glitter glue added to it for a little sparkle. I added some stitching, ribbon, button and a sticker sentiment from SRM Stickers to finish off the card. I hope that if it is winter where you are, you are staying nice and warm. As for me, I think I will go and cuddle with my hubby by the fire with a cup of hot cocoa. This is a gorgeous card and I really feel for you in thick, thick snow although I'm sure where you live, they're very organised for snow, whereas in this country; U.K, everything seems to grind to a halt. Anyway, enough of weather. I actually have the Winter Woodland cartridge and now that we can buy digital cartridges, I could soon get the Frames one and no postage and no customs to pay, so that's great! Your cold weather is just about to come to Michigan :D Hope we don't get that much snow! Love the embossing and how you can make a frame of lace to fit the card. 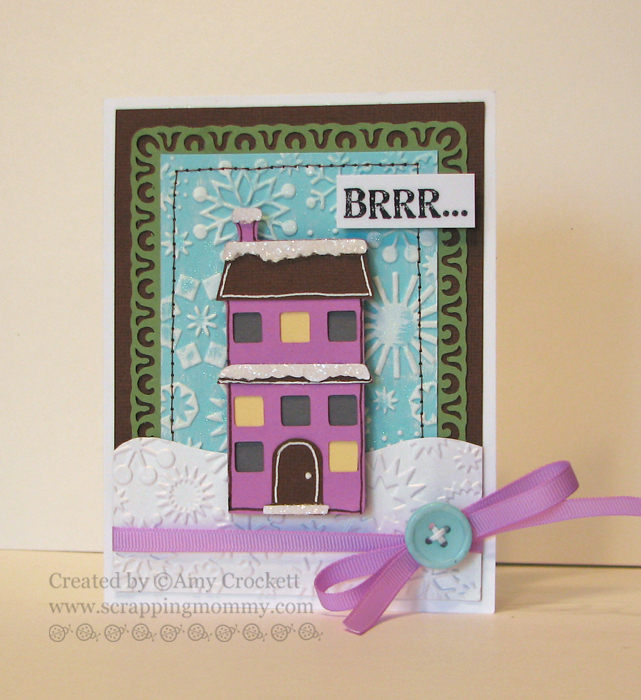 Amy ~ Oh what a PERFECT card for winter and after the storm you all just had! LOVe the cut and the idea to use the frame for part of the background! Embossing perfect, snow awesome and the colors fabulous! Hope you enjoyed your weekend!